The purpose of this event is to provide an opportunity for contractors and their teams to showcase some fantastic examples of outstanding professional performance within our locality. Our inaugural event was held in 2017 and celebrated the fantastic work that community pharmacy contractors and their teams have done throughout the year to improve the health and wellness of the people of Southampton, Hampshire, Isle of Wight & Portsmouth. The Committee was eager to formally recognise and celebrate the positive contribution that community pharmacy makes to patients and customers; at a time when the NHS and social care is under increasing pressure. Community Pharmacy is more than capable of rising to these chalenges and tonights event demonstrates the will and skill within our sector to take on a higher profile position as a member of the primary healthcare team. The evening started with a warm welcome address to our award nominees, speakers, sponsors, committee members and invited guests by Ashley Littlewood-Miller, Chairman of CPSC. Deborah Crockford, in-coming Chief Officer from September 2017, shared with us her long association with CPSC, having served as an elected representative of the committee for over 10 years now. During this time she spent 6 years leading in the post of our chair. Debby then went onto to explain her vision for the organisation, which includes increased face to face contact with contractors, creating greater consistency within our Wessex Academy to support and help develop more professional & profitable businesses and to develop our online presence through digital and social media. Work on this final point are now in place with the rebrand and modernising of the 'Hampshire & Isle of Wight LPC' name that we have been known as for many years to become Community Pharmacy South Central (CPSC). Our guest speaker, Alison Hemsworth was then welcomed and introduced by Debby to say a few words. Alison is the National Assistant Head of Primary Care Policy (Community Pharmacy & Dispensing Doctors) at NHS England. 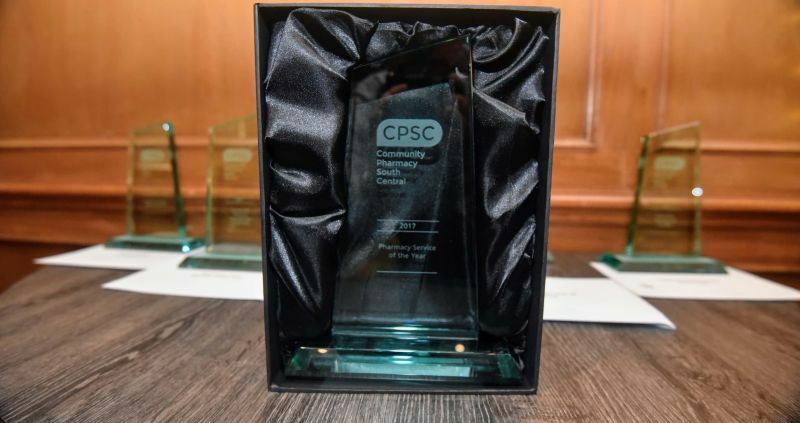 CPSC would like to express our thanks to Alison for attending and speaking at our first award ceremony and for sharing with us the many workstreams that she is currently involved with. It was great to see a packed room with so many excited pharmacists, technicians, managers and contractors present. The buzz in the room was audible throughout and the sense of anticipation as each category was awarded was a joy to feel. Thank you to all of you who attended this year, and to those that didn't; please look out for the 2018 Award dates and entry communications. We're sure that next year will be even bigger. Click the drop down box below to see the award categories and further details about the Inaugural 2017 event.